Jehoiakim, Jehoiachin, and Zedekiah rule Judah unfaithfully as it continues to fall apart at the seams in 2 Kings 24-25. Babylonian, Aramean, Moabite, and Ammonite raiders destroy the Promise Land that is left in Judah. The Lord's temple and the palace are stripped of all their treasures, and the Babylonians carry all of God's people into exile. Only the poorest of the poor and the least are left behind in their homeland. And just when you think things couldn't get any worse for Jerusalem, the least to the greatest are forced to flee to Egypt out of fear for their lives. Just like that, God's people are right back where they started during the days of Moses. God is right there with Moses and His people during the entire exodus out of Egypt. They experience His transforming presence. They follow Him during the uncertain times. And then once they enter the Promise Land and things are really good, God's people slowly let go of Him in their lives. They push their human desires to their limits until they are completely disconnected from God's will, and consequently His blessings, for their lives. I think it's a weakness that is human nature to some extent. Fear sets in, and we keep running away. We are bound by whatever sin gets in the way of our relationship with God. So how do we fight that? How do we make sure we aren't running from God's saving grace in our lives? God WANTS us to pray to Him. He longs for an open, on-going, intimate and honest conversation with me (and you). Thank You for hearing all my prayers and holding my hand when I reach for You. Forgive me for depending on myself and others all too often. Open my heart to Your transforming love and grace, Lord. Continue to guide me in Your way. Show what to do next for You this day. Here we go again, on a roller coaster of faith with God's people in Judah now that King Hezekiah is dead and buried (2 Kings 21-23). His son, King Manasseh, seems to fly on a long downhill slope as he leads the people to lots of evil in God's eyes. When he's gone, his son, King Amon, follows suit in the same direction. The consequences of their choices are far reaching, affecting generations to come. It's so sad. And then, we meet Amon's son, King Josiah, who gets things right again for God. He finds the book of God's Law, and that makes all the difference as Josiah is determined to renew God's covenant with His people. Ahhh, we can breathe in some life-giving air. I feel like holding on tight to my faith as I read. But before I can truly catch my breath, we're back to evil kings with Jehoahaz and Jehoiakim. Like I said, today's reading is a roller coaster of faith! I am shaking my head. These leaders just don't realize what they are doing to themselves and to those who are watching and following them. Their choices and examples, with the exception of King Josiah, are devastating. It's as if God's people have forgotten who they are. They are God's precious children. They belong to Him. He is their Father, their King, their only true Savior. And yet, no matter how chaotic their lives become, they forget to stop and hit their knees so they can look up to Him. He's the only One who can fix things. I have to tell you. I have been there, so caught up and busy in my own roller coaster of this earthly life that I have failed to turn to the author and giver of my new and eternal life. That's where King Josiah was in our reading, too, when he found the Book of Law from the time of Moses. Reading God's Word grounds Josiah. It changes his perspective on his place and purpose in the world, for the better. It also transforms his heart, and empowers him to do what is right, not for himself, but for the God who made him and saves him. Josiah's story is a testament to the power of God's Living Word. Like Hezekiah, Josiah "cleans house" for God and puts everything in its place, before Him. 25 Neither before nor after Josiah was there a king like him who turned to the Lord as he did—with all his heart and with all his soul and with all his strength, in accordance with all the Law of Moses. And the good news for us today, is that Christ, the author and perfecter of our faith, died for our sins. So, it's never too late to turn our lives around or redirect ourselves when we become lost. We can all do it by turning everything over to God! And when we do, God promises us new-life, both now and for eternity. Thank You for Your Living Holy Word. Unleash the Holy Spirit within me as I read and transform me. Fill me with new-life. Ground me in Your place and purpose for me. I want to understand Your Word for my life, please Father. -This is a post written by my cousin and dear friend. It's such a powerful example of God's real and powerful presence in our lives that I just have to share her story. Hope you enjoy! I was alone for a moment with my baby in a large Chinese city. A thick haze from pollution and the tall buildings blocked my view of the sky as I sat on a curb watching the people shuffle past. Most of the women on the street would stop to smile and speak to my baby. The sights around me confirmed that I was farther away from home than I had ever been, but I felt peaceful. Anyone who knows me knows I am afraid of pretty much everything. So for me to feel peace thousands of miles away from home meant that God was there with us. It was not going to matter how scared I was or how many obstacles there were; my husband and I were going to get our daughter home. I trace my desire to adopt back to high school when I learned about China’s one-child policy and the consequences of that policy—thousands of abandoned children. I knew that someday I would help in some way. I just didn’t know how. My husband also felt a tug on his heart regarding orphans while he was in school. It is amazing that God was preparing our hearts even when our immature minds were full of the frivolity of youth. We were confident that we wanted this adoption to be led by God. He showed us that a Chinese daughter with special needs was right for our family. The adoption process is a long and often tedious “paper pregnancy.” I procrastinated on paperwork and felt disconnected with the process in its early stages. Our family was not matched with a specific child, so it was difficult to see the finish line. But God was there tugging us along and helping us make all the deadlines. The first page of my adoption journal reads, “To our precious child who we haven’t met or seen, yet have an overflowing love for.” I wondered as I wrote these words who this little one was and how long would it be until I would see her face. The adoption agency told us that after all of our paperwork was approved that it could take up to eight months or more to find our daughter. God had different plans. “I will rescue the lame and gather those who have been scattered. I will give them praise and honor in every land where they were put to shame. At that time I will gather you; at that time I will bring you home. You see our daughter was abandoned in a shopping mall at one week old. God was asking me to forget all of my concerns and selfishness and focus on our daughter. She was scattered and needed a home. God was going to use our family to restore her. Our family and friends surrounded us with love, support and prayer as we prepared to make the trip to China. When the day finally came, we were excited and nervous. Sometimes figuring out God’s will for our lives can be tricky, and we are not sure which way to turn. However, there are times when you are resting in God’s will and you feel a peace that you are right where God wants you. The latter is where my husband and I were the day we stepped on the plane for China. We knew that God had prepared our daughter in our hearts, and we knew we had to gather her and bring her home. We had decided to give our daughter an English name from our family. We met her on January 20, 2014. She was scared but brave. She didn’t even cry. After a good night’s rest and a big breakfast, she started to warm up to us. Our daughter started smiling and becoming more animated on day two. I knew that God was allowing her to open up to us. China was a challenge for me. I do not embrace new experiences. The trip highlighted many of my weaknesses: air travel, crowded stores (you can’t imagine the craziness of the Chinese Walmart), lack of sleep, having my patience stretched thin, public toilets with sanitation you’d never find in America, and being Hangry (a combination of hungry and angry). 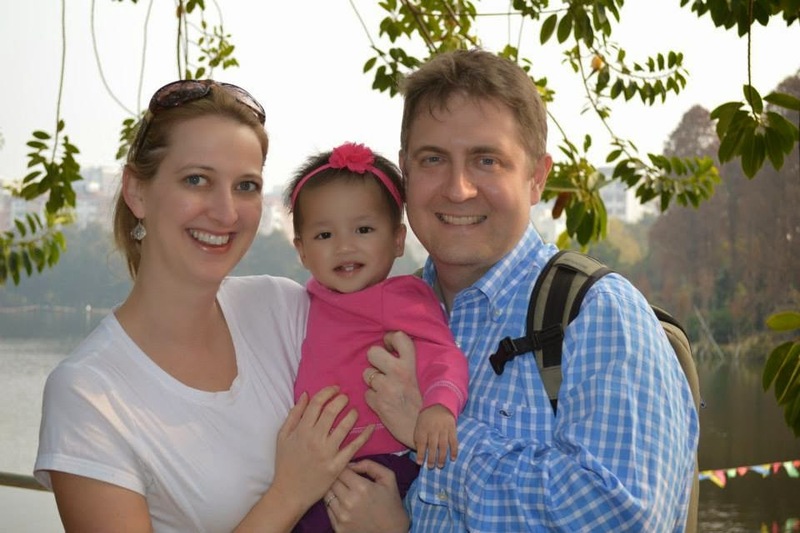 But China gave us many new adoptive friends, and we had begun the process of bonding with our daughter. As we arrived home with our baby girl amidst a record breaking ice storm, our hearts melted as we hugged all three of our girls at the same time. The past few months have been both challenging and amazing. I have watched as God has smoothed out the details in ways I could have never imagined. I have watched with excitement as our new daughter has started to walk and learn to communicate. But most importantly, God seamlessly made us into a family, a true miracle. Ask yourself: What is tugging at your heartstrings? What is God asking you to do today? Thank You for making me a part of Your family through Christ, my Lord and Savior. I am so grateful for all the ways You work all things for good and Your glory and guide me with tugs on my heartstrings. Help me to know You and the plans You have for me this day and always. I trust You to take care of all the details. Show me exactly who You need me to love and how to do it in just the right ways. 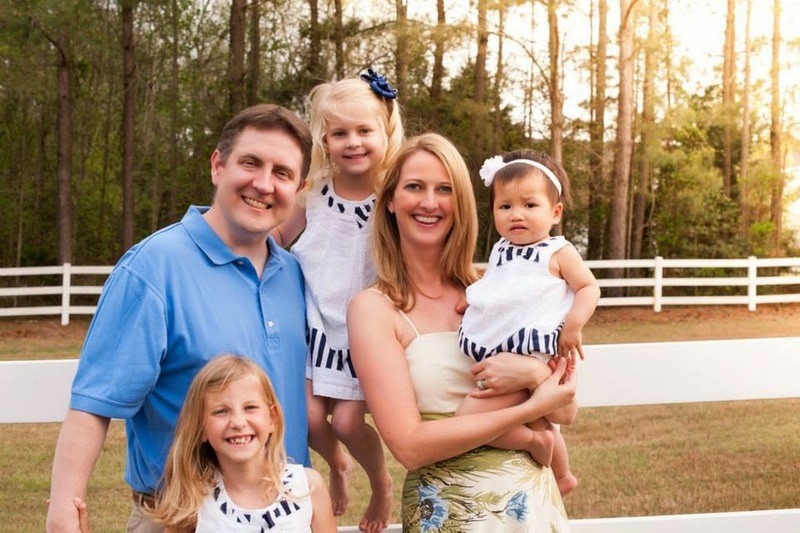 I pray for this precious family and all those touched by adoption. May Your love continue to bless them with grace and peace that passes all understanding. So, some light shines in the darkness in 2 Kings 18-20 through Judah's King Hezekiah. Much of Israel (the other faction) is exiled from their homeland by the Assyrians, but this guy in Judah gets it right like the great King David, serving God as He reigns. His time as king is full of challenges. The king of Assyria threatens to take Hezekiah and Judah down with his skilled and well-equipped entourage. However, God works out the details of Assyria's defeat instead. Hezekiah is near death from an illness, but God restores his health because of his sincere and heartfelt prayer. There are no ifs, ands, or buts about King Hezekiah's loyalty to God. God is with him, making him successful. Finally, there's a leader in Judah who puts God first, just like King David, and it shows! This is such good news in the middle of Israel's biblical soap opera we've been reading. The man basically cleaned house for God, with Him in mind at all times. He trusted God, and He was really good at putting it all out there in prayer. It seems so simple when I look at it that way, but I think it gets complicated when we have to follow through in the middle of our chaotic and ever-changing lives. So, what about it? How do I need to clean house with God in mind? How do I need to trust God more? And what do I need to bring before God in prayer? And when I do, life just gets better and better. Thank You for being my strength and my redeemer. Forgive me for the ways I act on my own imperfect thoughts and ways day to day. Help me to clean house for You on a regular, as-needed basis. Show me where and how to trust You more. And, Lord, open my heart to all the things I need to bring to You in prayer. Speak to me. I want to follow You and do what is right in Your eyes. Boy, there are some crazy kings in charge throughout 2 Kings 16-17. They are self-defeating, but they can't see it. And the more time that goes on, the worse the situation gets for God's people. Fighting and instability are everywhere. The king of Israel joins forces with the king of Aram and attempts to overtake the king of Judah, but it doesn't work. That's because Ahaz, king of Israel at the time, decides to send silver and gold from the Lord's temple and treasures from the royal palace to the king of Assyria in order to illicit his help in defending Judah against the joint attack by Israel and Aram. Israel is falling apart. In the end, the king of Assyria invades Samaria and deports all the Israelites living there to Assyria. God's people are exiled from their homeland. What a mess! When things get this bad, we can't help but ask "why." We search for a reason behind the madness that can overwhelm us. And if you've ever been there, in the middle of some crazy, hard and impossible-to-understand stuff, you've probably also heard a certain all-too common (in my personal opinion) response- that is the saying that "everything happens for a reason." Take the situation in today's reading for example. Things are bad, really bad. God's own people are forced to leave their homes and live in a foreign land. That must have been heart wrenching and scary for families, especially children. The terrible situations for both parties (the Assyrians attempting to live in Samaria and the Israelites exiled to Assyria) are no accident. God warned His people that this would happen while giving them His law and sending prophet after prophet. So, it is true that everything is happening for a reason. This popular saying bothers me sometimes, though, because I have heard it and thought it one too many times in my life without knowing what in the world I am doing. It suggests that God has a plan for everything, which He most definitely does, and it's a perfect one and a good one. But, it also worries me, that saying "everything happens for a reason" desensitizes me to the always necessary personal responsibility I have in honoring God's plan for my life. And that kind of attitude can, if I'm not careful, blame God instead of honor Him. 41 Even while these people were worshiping the Lord, they were serving their idols. To this day their children and grandchildren continue to do as their ancestors did. I don't share my thoughts to offend or discredit anyone but to challenge us to examine our cultural, routine, and habitual ways of thinking and doing. Are we continually "bowing down?" And if we are, to whom are we bowing down? I can't live for myself and live for my Lord and Savior. That isn't faith. What are your thoughts on "everything happens for a reason" in light of today's reading? Thank You for saving me by Your grace, through my faith in Jesus Christ. Guide me in all the ways I need to turn to Jesus and bow down to You, Lord. Help me let go the "idols" in my life and hold on to Your outstretched hand instead. Fill me with Your perfect love and Your power and peace that passes understanding. Use me as I live and learn. I also this prayer for ____________ today. It seems like 2 Kings 13-15 is even more of a bad soap opera than yesterday's reading. Evil, bribery, treason, murderous plots, greed, and personal gain rule the land. Following King Joash's assignation, his son, Amaziah, takes over as king of Judah. Jehoahaz, son of Jehu, becomes king of Israel in Samaria. These kings are succeeded by several others, whose names I cannot even begin to pronounce. There's King Jehoash who fights against King Amaziah, followed by Azariah (who had leprosy), Jeroboam, Zechariah, Uzziah, Jotham, Shallum, Manehem, Pekahiah, Pekah, and Hoshea. What do I do with all of this? I do the only thing I can do when I just don't get it. I talk to God and say a little prayer for guidance and help in pulling some meaning from my reading. Because no matter how lost and confused I am, God's Word always finds a way to shine some light in my life. So, what stands out to me today? 34 He did what was right in the sight of the Lord, just as his father Uzziah had done. 35 Nevertheless the high places were not removed; the people still sacrificed and made offerings on the high places. He built the upper gate of the house of the Lord. "Nevertheless"...that's what gets me. To me, it's like saying, He did well, but he still didn't take care of...."
During Bible times, these "high places" referred to hills or mountains where God's people either attempted to worship God or idols "their way," taking matters into their own hands. "High places" were contrary to God's sovereign way. The "high places" in our lives today are things that hinder the fullness of our faith, no matter how much we try to avoid them, ignore them, justify them, or pretend they aren't there. If we don't deal with them, "high places" in our lives can make things really confusing and messy, like they continue to do for Israel. Thank goodness we have a High Priest in our Lord and Savior- who not only redeems us, He heals us and sets us free. I thank You for loving me. Forgive me for all the places in my life where my priorities do not line up with Your sovereign and perfect will for me. I pray for Your guidance and discernment to know what I need to bring to You for Your healing and transforming touch. I know Your ways are much higher than my ways. I am trying to do the right thing for You, Lord, but I am struggling with ________________. Help me, please. I know ____________ is also struggling. Please be with him/her/them as well. We have a real biblical soap opera going on in 2 Kings 11-12. The great nation of Israel is getting smaller and smaller as people get caught up in their own selfish ways. We meet a crazy woman named Athaliah, mother of former King Ahaziah, who's really upset that her son is dead. She ends up destroying the whole royal family so she can rule the land herself. Little does she know, one baby boy, named Joash, escapes her murderous hands and hides in the temple of the Lord for six years. With the help of Jehoiada, the priest, Joash is protected and anointed king of Judah at the age of seven. Joash, like Jehu, does what is right for God and His people. So like I said, it's a real soap opera. Now, I just have to be honest about my reading today. I am completely lost in the sea of hard to pronounce names, and let's not even mention the problems they cause for my automatic spell-checker! At this point in 2 Kings, there have been so many changes in leadership and so many fall-outs, I can't keep up with who's who at all. And, it doesn't help matters that as of right now, Israel has two divisions, with a king for Judah and a king for greater Israel. And, we can't forget the strong-willed queens that make an appearance from time to time. It's a real mess from my perspective, and I had to reread several times to keep up and try to make some sense of what is happening. I am telling you all of this because I think it's normal to be lost and confused in our Bible reading from time to time. It's okay to "not get it" sometimes. That doesn't make our reading worthless. We can still find meaning and inspiration for our own lives even when we don't understand everything. So, for today, I prayed a little prayer to myself and asked God to give me some sense of direction and a little understanding. 2 Jehoash did what was right in the sight of the Lord all his days, because the priest Jehoiada instructed him. Jehoash is called to lead God's people at the young age of seven, a time in his life when there's no way he could possibly understand everything, let alone have the maturity to follow through with all of his kingly responsibilities. And, it's okay. God has called Jehoash to his job as king just like God calls us to read His word. And, I think we forget, as we grow-up, that God looks at us just like we look at Jehoash. We are God's children. He is our Father. God doesn't expect us to know and do everything on our own. When God calls us to something (whatever it may be), even if it's something simple like reading His word, He makes the way and gives us the understanding we need at just the right time. And, that understanding might not always be instantaneous, nor will it always be what we'd expect. That's how God works in us because He wants us to depend on Him (not others, not things) and KNOW His transcendent power. I thank You for making me Your beloved child, and I thank You for Your word that guides me. Lord, as I read, fill my heart with the truths You need me to understand. Help me to know You better and to feel the power of Your transcendent love, grace, mercy, and hope for my life. I know ______________ needs to be filled with Your word for his/her life too. Please be with him/her this day. We see strong and faithful leadership taking over as Jehu is anointed King of Israel in 2 Kings 9-10. There's no question, this new king really means business for God! He's out to avenge so many wrongs that have been left unattended in Israel for too long. He doesn't mess around as he deals with kings, Ahab and Joram and their families. I couldn't help but laugh as I picture Jehu driving like a maniac to set things straight with the ruthless Jezebel, who was long overdue for reaping what she sowed. This guy doesn't put up with Baal and those who worship him either. Although, Jehu isn't perfect, he is on a mission for God, and people know it! I love the energy Jehu, the crazy chariot driver, has for God. He has the kind of faith that is strong and contagious. Who is going to stand in the way of faith like his? And in thinking about my own faith, I wonder where and how God needs others to see my zeal for Him? Thank You for blessing me with the encouragement and inspiration that comes from Your faithful servants. Forgive the ways I hesitate to go into the world with zeal for You. Open my heart to the ways I need to go with You, full of zeal. Fill me with Your Spirit and love. I also pray all those who are down, low on energy, and so broken they are unable to reach out to You. I pray for those who are suffering, who are lost, who are hurting and in desperate need of Your transformational healing in their lives. In Kings 7-8, Elisha continues to share God's word. The problem is, the news isn't good for Israel. God's people endure seven years of famine while under siege by the Arameans. People are starving for all they don't have, and they resort to eating each other. Four men with leprosy, with nothing to lose, play a major role in discovering Israel's relief. New kings come and go with no change in morality, just more division. Israel still lacks faithful leadership, and the consequences are stacking against this currently, not so great, nation. Do you remember the Shunammite woman who built the room in her home for Elisha? And later, Elisha blessed her with a son who ended up dying, and Elisha brought him back to life. That's the Shunammite woman I'm talking about today, because we see a little bit more of her story unfold. This Shunammite woman is another illustration of the difference faith makes, even when the world around us is literally falling apart. She shows us what it looks like to live by faith and not by sight. She escapes the famine because she trusts Elisha and God's direction for her life. And when she returns, God blesses her with the land she had plus interest! I can't help but notice how the Shunammite woman's faith becomes an impactful and engaging story of God's power, God's love, and God's grace for those who believe. 5 Just as Gehazi was telling the king how Elisha had restored the dead to life, the woman whose son Elisha had brought back to life came to appeal to the king for her house and land. The sequence and timing of life events for this woman and for us are no accident. They are just one way God provides us with opportunities to be blessed and to be a blessing to others. How might God be using you and working your life story for His glory? Thank You for the opportunity to be a part of Your kingdom and a reflection of Your glorious light in the world. Forgive me for the opportunities I miss to share Your story and Your love with others. I pray You will fill me with the right words and the right ways to connect with others and be a blessing. I struggle with this sometimes. Fill me with Your wisdom and strength. I especially want to pray for ________________ today. You are my Rock and my Redeemer, Lord. We read more about Elisha, the prophet in 2 Kings 5-6. He has a hand in healing Naaman's leprosy, makes an ax float, and traps the Arameans when they fight against Israel. Elisha is busy working for God, and things that are beyond our normal explanation are happening wherever he goes. When I read the Bible, I see bits of myself in some of the people I meet. That happened to me today as I was reading about Naaman. Naaman goes to Elisha, the man of God, to be healed from leprosy. He takes the leap of faith to seek Elisha's advice, but when Elisha tells him what he needs to do next, Naaman stumbles because the advice isn't what he expects. 11 But Naaman went away angry and said, “I thought that he would surely come out to me and stand and call on the name of the Lord his God, wave his hand over the spot and cure me of my leprosy. Naaman almost missed a life-saving miracle because the road or path to the miracle wasn't full of the steps he anticipated or imagined for himself. This is such an important reminder for me to get out of the my own way with my expectations so that God has room to work HIS miracles in my life for HIS glory. Thank You for Your guidance in my life. Forgive me when I let my own expectations and limitations get in the way of Your bigger plans for my life. Lord, continue to speak to my heart and direct my steps. I pray that You will help me let go of all the expectations that distract me from following You. I don't want to miss the ways Your power and presence can change me and the world for the better. I trust You, Lord, with all my heart. Elisha's connection to God is such a welcomed breath of fresh air in 2 Kings 3-4 especially since so many are disconnected from God. This man, a well-known prophet, has an awesome relationship with God, and people near and far know it. They can see it. With Elisha's help, the two divisions of God's people, Israel and Judah, unite against Moab and win. Elisha also helps a widow who has nothing but olive oil to her name, and brings a Shunammite's son back to life. Elisha's work with God is amazing, above and beyond anything else that is happening during this time. Elisha's faith in God makes all the difference in so many people's lives. God makes all the difference in the world, in our lives too. I read through Elijah's ministry, and I can't help but think of Jesus. It's like we're getting a little preview of the Messiah that is to come. We have a tiny glimpse of the perfect, life-saving, life-giving, contagious faith that comes to us in Jesus so many years later. Thank goodness Christ is risen and lives to make all the difference, not only for our eternal lives, bur for our lives today, right now. All we have to do, like the Shunammite woman, is leave lots of room for God in our lives. And like the widow with the olive oil, God wraps us in His strong arms and takes care of us. The transforming love of Christ is here, ready to work in us. The mighty power of God is within reach for us. Jesus suffers for us, not to get rid of it but to redeem it with new life. His indwelling Spirit fills us, heals us, and uses us for a life of more. The skies are no limit when we make room for God. I thank You for Your Son, Jesus, who suffered on the cross to make all the difference in my life. Forgive me for all the ways I take Your saving grace for granted. Help me give You all the room You need to work in my life, so that my faith makes a differences in the lives of those around me. I want to do amazing things for You, Lord. Make me an instrument of Your grace, and to You, be all the glory!